Tsukiko is a 38-year old office lady in an undistinguished Japanese company, leading an average life. One evening, as Tsukiko orders her dinner at a small bar, she is addressed by the old man next to her. Surprised at the approach, she finally recognizes him as her teacher of Japanese literature from high school. From that evening on, they keep meeting each other – always unplanned – and marvel about how similar they are. Sensei and Tsukiko like the same food and drinks and eat the same snacks to their sake. After a while, they begin to meet on purpose, for short little trips to the local market or to the high school reunion. Their feelings for each other and the perceived unlawfulness of them leads to internal struggles for both. Will they overcome their fears and stop hiding their feelings? This is a wonderful love story between two soul mates who struggle not only to overcome an age difference of 30 years, but also their own perceptions of what an “appropriate” relationship should look like. 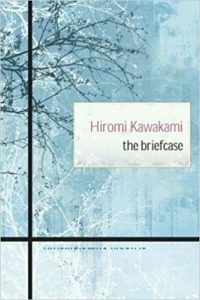 Hiromi Kawakami, born 1958 in Tokyo, studied science, taught biology, and wrote short sci-fi stories before her first book was published in 1994. She counts among the most popular authors of Japan. This book received the Tanizaki Prize in 2001, and has been made into a movie. If you want to find out whether Tsukiko and her sensei get together at the end, get the book from amazon! This entry was posted in All Things Japanese, literature by Iris. Bookmark the permalink.